Part 2. LNC visited the Boeing KC-46A Everett Modification Center last month. Part 1 appears here. July 5, 2018, © Leeham News: Boeing’s contract with the US Air Force for three dozen KC-46A tankers is but the tip of the iceberg. Installing the refueling boom on a KC-46A tanker at the Everett Modification Center. Boeing photo. There are more than 400 ancient Boeing KC-135s that have to be replaced. Boeing figures it will eventually see the initial 179 aircraft requirement expanded to cover the balance of the KC-135s, although due to budget constraints, last year there were reports the procurement will stop and 179 and the KC-135s will be upgraded. Then there is the international market. Airbus so far is far and away the winner in this sector. It’s sold 57 to eight customers (including NATO); 29 are in operation. The first one entered service in 2011. Boeing has made one international sale of the KC-46A, to Japan for one airplane. Mike Hafer, manager of Global Sales and Marketing, says Japan has funds to order three more, preferring to operate squadrons of four aircraft. These will supplement the four KC-767 International tankers Japan ordered in 2003. Italy is the only other operator of the KC-767 new-build tanker (also for four). Hafer said there are several international customers who “are interesting in pursing the KC-46,” but no orders have been placed. He sees a potential for up to 60 international sales. The KC-46A is a brand new airplane, trailing the KC-30 by years. Hafer said the KC-30 and KC-46A “are two different airplanes,” beginning with the smaller footprint of the KC-46A making it closer to a KC-135 replacement than the larger KC-30. The KC-46A can operate out of smaller airfields than the KC-30, he says, and get “closer to the fight.” This was one of the many arguments Boeing and its supporters made during the KC-X competition. Hafer ticks off a list of features of the KC-46A, ranging from key electronic systems, defensive measures, electronic protective measures, flight deck armor and even the large cargo door that are standard on the Boeing airplane and options on the KC-30. There were some international customers that needed a large passenger jet that also did aerial refueling who chose the KC-30, he said. The current status of the KC-46A, following flight testing and ramp validation, “that has it off international interest,” Hafer said. Even some of the nations flying the KC-30 expressed interest in the KC-46. Politicians look at jobs and “it’s a tough bill of sale to say you’ve gone to a foreign country to buy their product as opposed to buying the home product,” Hafer said. Indeed, jobs created and supported by Boeing vs Airbus in the KC-X competition were a huge political element of debate. 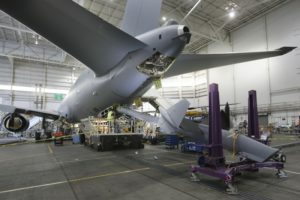 Even though Airbus pledged to build a US assembly plant for the KC-30, the airplane would largely be manufactured overseas. Conversely, observers gave Boeing no chance of winning tanker contracts in France and Germany, where the A330 is made. James Burgess, VP Dep Program Manager for KC-46, who came from Boeing’s P-8 anti-submarine aircraft program, said that it took a while for foreign countries to order the 737-based airplane (even though there isn’t a comparable, competing product). Hafer said the KC-46 can be reconfigured for personnel, cargo or a mixture in two hours. The KC-46A is designed to operate entirely “dark,” if necessary, including on the ground. Personnel wear night vision goggles. When airborne, navigation and interior lights may be turned off. On the ground, servicing and provisioning may be carried out without lights with the ground crews wearing night vision equipment. Boeing designed a ground-start Auxiliary Power Unit apparatus located in the belly that allows the crew to press the self-contained APU start button, shaving minutes off the readiness time while the crew scrambles into the cockpit and goes through the pre-flight checklist. There is also a refueling port in the belly, eliminating the need for ladders and wing-located refueling connections at more primitive airfields. As Boeing produces more and more airplanes and gains experience, the learning curve reduces costs and production time. As noted in Part 1, the USAF only wants 15-18 airplanes a year. But this doesn’t mean that there are other ways to cut costs. In what may be a small example: The refueling boom is produced at the EMC, but this wasn’t always so. The boom originally was produced at another Boeing plant in South Puget Sound, easily up to a two hour drive from the Everett plant at rush hour in the highly traffic-congested Seattle area. The boom production was relocated to the EMC, saving time and cutting costs. Paul Grasher, the KC-46 Boom Operations manager, said that every week the staff discusses ideas to become more efficient and reduce costs. New ways to produces parts, cut the number of parts and cut the time to make the parts were identified and engineered. In one case, the time to produce a key component for the refueling boom was cut by 50%, he said. The clamshell doors to the APU, located in the tail and initially obstructed by the refueling boom, were redesigned, Hafer said. It seems to me that nations with smaller air forces (thus small fleets of tankers) find the KC-30 offers more flexibility than the 767-based tanker. Sales thus far support this. You can”t easily load up a few booms a month and send them up North? Really? So we should all grown our carrots in the front yard, it would save so much money because we wold not have to go to the grocery store. And how do the material to MAKE the boom get to EMC? Hint: Can you say truck? What did it cost to MOVE the boom operations? Interesting that the boom is assembled at the EMC, that must have been what the new building was for . Why did Boeing evade when asked about it before ? Interesting that you got an invitation to vist at the same time as Lauren Thompson wrote a piece for Forbes. How much pressure is there to be nice?Thompson is paid directly,so his article is ridiculess,complete with some Trump brown nosing.Boeing PR dept are after a production rate increase. Ah, I believe it’s “Loren”, a man. After a few years of service the KC46-A will have the issues ironed out, large scale production will reduce costs and it will be a very good platform. Compared to the aging KC135 fleet it has far superior cargo / passenger capability . It will probably reduce C-17 hours significantyly saving costs / extending life on that side. Moving 30-40t over 6-7 hr flights at probably less than half C-17 costs per hour. And the USAF will slow down CRAF use which is at far more that minimum. Mostly it will intensively fly fueling missions which is how we handle our vast tanker fleet and reserve the cargo for the specialized cargo types. As I was in somewhat of the cross roads of the issues with Cargo at the time I can comment on that. CRAF fell on the freighter companies as they had plenty of charter aircraft for troops. It hurt bottom lines as only UPS and FedEx had the cargo end and no one else was impacted. They made adjustments to the program. B: Little Lies R Us. for all “same amount of fuel delivered on station” missions? B also had the Japanese and Italian tanker derivatives as “show off” samples available. this is largely based on the fact that the KC-46 takes up less ramp space, has a shorter wingspan and a much lower ACN (index of an aircraft’s impact on airfield pavements) so can operate from airfields with smaller, weaker ramps and narrower taxiway clearances. so “smaller” doesn’t necessarily mean shorter runways. back in the day at a AF base in Germany where I was stationed, anything much larger than a -135 could not even taxi off the main runway due to clearance issues, so when a C-5 or KC-10 would come in, they would have to park it on the run-up pad at the end of the runway, shutting the base down. a KC-46 would be able to taxi down to and park on the main ramp there as the wings only stick out another 9 feet on each side and the ACNs are similar, but to get a KC-30 down would have required a lot of construction to widen the clearances since the wings stick out a further 35′ on each side and the ramp would need to be rebuilt stronger/thicker/larger to stand up to the more punishing load. And most of the fuel is brought back. Short of a KC-10 type mission fueling 5 x C-17s, the front line fueling is in small amounts. The long range birds are fueled up well back of the battle zone. Those areas do not have base limitations. Reengined B52’s with the latest PWA or GE engines Will reduce full burn up to 40%. That Will reduce the nummer of tankers. Similar as B1’s are replaced with B21’s can reduce areal refuelling depending on tank sizes. F35A’s that is pretty fat with small tanks and no drop tanks Will increase the need. Interesting point, on some really long range missions the refuellers need refuelling,so it’s a virtuous circle. Boeing now also after killing the 330MRTT, for some reason BA is worried about the 330’s (NEO)? You see full spectrum undeclared war. By the US in general and on the rest of the globe. The Home Industry is in lockstep. I know, right! We shouldn’t be surprised though, as this is typical of his posts. Perhaps he is hoping some other western country steals the “Descent Into Fascism” trophy. It would validate all his wild conspiracy claims if the US did it, but alas, I think that one is staying in Germany’s case for a long time. I will no longer respond to any of his posts. What a non-sense. Look at national incomes & budgets, that should be enough. 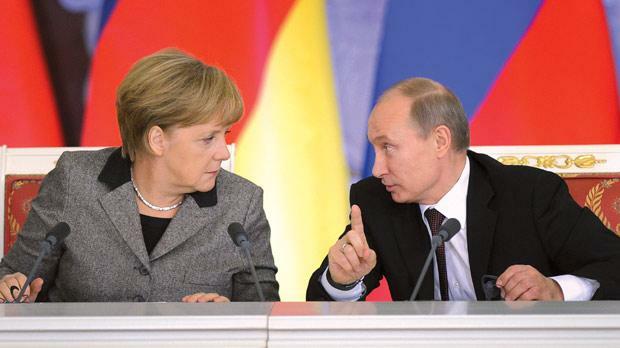 In reality relations between Germany & Russia over the last 25 years deepened. There are political conflicts interests etc. however leadership inherited the deep scars of the destructive wars between the countries in the 20th century & understand that road is closed forever. Puttin & Merkel don’t like each other but they are sensible & know their responsibilities. And no weapons enthousiasts / cold war revisionist are gonna change that. Oh Lord, a records clerk from the KGB knows his responsibilities? Other than going around on horseback with no shirt to show us his ABs? Woweeee. And they say the US has a split in logic. who has all of 90 tanks that can shoot right now? No subs that can float. An Air Force that has all of 25 combat ready Typhoons? You do know Germany has an obligation to NATO and its 2% minimum of GDP? Poland and the Eastern EU fringe are a problem and not a shield for Germany. Actually the PIS government is a major PITA. The real Arsonist is the US and not the RF. Having a non working military keeps us out of further US misplaced military adventures. Have you not read Mr Thompson’s article?Its all down to Obama and illegal subsidies for Airbus. UWE mentioned the ‘small field capability’, and the contradictions in that. The ‘can use more airfields’ statement, as UWE points out is a bit misleading as this is based solely on stand size. I recall that when the RAF compared the MRTT vs the KC30, specifically looking at their base of Brize Norton, the main issue was runway length rather than stand size, with the 767 being payload limited off their base, with the MRTT having no such restrictions (despite it’s greater payload), something likely replicated world wide. Or having RR engines on their makes not the least bit of difference! No pesky boom to carry either. I think the RAF ordered 2 types, 1 without a boom and one with a boom. Unfortunately, they only ordered the Voyager type with the hose and drogue. It would make some sense to add a few refueling booms to the fleet given they have some US aircraft such as the P-8 that use a refueling boom. However, given the high demands on British defense funds for F-35s and other expensive acquisitions I doubt well see any booms added in the future. Sorry, but I’m going to have to call BS on this. RAF Brize Norton has a 10,007 ft runway and sits 289 ft elevation. The 767-300F with PW4062 engines at it’s max take off weight of 415,000 lbs requires 8600 ft to take off on a standard day at sea level and 8900 ft on a standard +15C day. The KC-46A has a 415,000 lb max take off weight and PW4062 engines so the 767-300F is the closest 767 for comparing take off distance. The fuselage of the KC-46A is shorter than the 300F but the base of the boom protrudes from the fuselage bottom about where the strike pad would be, so the max rotation angle is about the same or slightly less than the 300F. However, the KC-46A has the better high lift system from the 400ER, and the engines are most likely PIP’d a little giving a take off performance that could be slightly better than the 300F. In comparison, the A330-200 (on which the A330 MRTT is based) requires between 9,800 ft and 10,000 ft to take off depending on engine choice at ISA conditions when the max take off weight is 514,000 lbs. When the conditions are ISA+15C the required take off distances are between 10,400 ft and 10,800 ft.
I’m not sure why you think the KC-46A is payload limited at RAF Brize Norton, or why you think the A330 MRTT performs better when, in fact, the MRTT appears to be payload limited. Thanks Mike, I was to sick to get details and disagree. We can also throw in the A330 has larger engines and uses more fuel. One of the points of the RFP was fuel use for 20 years. While not huge per each flight, add up all the flights over 20 years and its billions involved. Also, I just found a copy of the NG KC-30 quad fold brochure. I think this is where MHalblaub gets his talking points. It is a comparison of the KC-30 with the KC-767 (not the KC-46) which states that the KC-767 could take off in 7000 ft with a full load of fuel (202,000 lbs). Keep in mind that this is what the competition has conceded about the KC-767. I would highly doubt that the KC-46 requires more than 7000 ft with it’s full fuel load of 212,299 lbs since this was an objective requirement in the RFP. Sounds right, as well as European branch of conspiracy nuts. The 330-800 (251T) could serve as a very capable 330MRTT “Mark2”. Not sure how easy it will be to make a tanker (and/or freighter) out of the 787’s? A few lights are coming up for me in Boeing’s “war” against the 330NEO. So you think for a few sales they are going to mod the whole A330CEO MRT into an NEO. without ACT addons MTOW beyond ~235t (110t fuel + 120t oew + a picnic basket ) doesn’t give much towards the tanker use. I can’t see Airbus using the A330-800 as a future tanker. If they were selling hundreds of passenger models, sure. But they’re not. The additional costs vs possible orders almost guarantee their tanker will continue to be based on the A330-200. I don’t know any military would need the extra capability of the -800 and most militaries are not that concerned about operating costs because they’re not flying the planes for 18 hours a day. Point/s taken, but is that not the reason why BA wants to “kill” the 330NEO. No, its thousands of sales of commercial jets. I take Umbrage with calling the KC-135R ancient. They are in fact the newer KC-135s built, they have been upgraded including CFM engines. The replacement is 10 years latter than they should have been and the doom and gloom of them falling out of the sky has proven to be plane (sp intended) wrong. If you saw one on the flight line you would think they have been just rolled out of the factory. I wish I was in that good a condition. Please note B-52H is still fully available and for the 2030-40 time frame, people sill fly 737-200s and Dash 8. @TW, when was the last time you tried to navigate I-5, SR167 and I-405 here? Scott: I take the buss between Seattle and B ham every couple of years. I hear management spin every day. Bid difference for those of us in the trenches that make things work and others. So yes I know what Seattle traffic is like, vastly worse down in CA back in the 70s in the Bay area. More so in the early 90s the last time I was there (including on a weekend) and don’t ever get me started on LA at any time. So, tens of thousands of trucks a day move around Seattle every day and they can’t ruck a few booms North? Lets train 737 fuselage all the way from Kansas? And a few Booms can’t be put on a truck? Costco gets stocked, Safeway gets stocked, Kroger, REI, Nordstrom and every other business does. Each grocery store gets 10 a week 40 foot vans? More? When managers want to shuffle things they come with all sorts of excuses. Seldom if ever the stated reason for what they say it is. Or as my younger brother taught me, What its about is not what its about. I do not understand why some people have to be so critical of the comments being made by the Boeing people. Hafer, Grasher et al are being asked to represent the company and their product and they do so in a reasonable manner. I think it is obvious that they want to improve the construction process and product as they get more experience. Is everything going to save millions of dollars or man hours? No, but at least they are looking at it and the people on the ground are getting input. Maybe it only reduces trucking costs… or maybe it frees up space at the original site for other things? Who knows? But at least they are looking at stuff. Heck, they specifically say the Airbus product is also a fine airplane. So why so much negativity? The 767 is still the aircraft Boeing was forced to build the 787 to compete against the A330. Just being late makes something not better. Only France is an operator of a somehow bigger KC-135 fleet with 14 aircraft. Other A330MRTT customers had no need to replace KC-135. They never operated them. What will USAF do on smaller airfields? Park KC-46s there until the fight is over? On the other side the KC-30 can take of with the required fuel amount from nearly twice as much airfields than the KC-46. Due to the bigger wing! A tanker aircraft needs something you won’t get on smaller airfields close to the fight – a huge amount of fuel. A big fuel depot close to the fight – fun for the enemy! Without the cargo doors on main deck KC-46 would not be able to handle cargo at all. Therefor KC-46 also needs a main deck cargo floor and palletized seating in case you want to move troops. All A330MRTT ordered today have standard airline seating (except the Australian VIP one) and the customers are satisfied with standard A330 cargo capacity still available on the lower deck. Maybe the standard KC-46 with all the features is more expensive than an A330MRTT without. You can add more features to an A330MRTT but for what reason? I must admit RAF is doing airline services from the UK to the Falklands but UAE, Saudi Arabia, Singapore or South Korea? Whenever “day one” will be. USAF is still not amused. Over the vastnesses of the Pacific even 110 t of fuel could be to little but politics wanted an even smaller tanker. Was Boeing willing to produce a tanker somewhere in Europe? There is a major difference between PR and how things function. In WWII the US had an entity called the Tank Destroyer branch. Lighter armor, response to tank attacks, held at the divisional level. What they do in in the war was that the Divisions used them just the same at Tanks. Ergo, end of the war the TD command disappeared. 75% of a Tankers fuel is brought back (forward edge of the fight). So having 500,000 gallons just to bring 400,000 back gets you what? The KC-10 value is not in cargo, its in allowing a flight of several C-17s, C5 or B-52 to get off the runway, on their way with max cargo, top off the group and keep them on their way. Forward airports are ramp limited (width mostly). Longer wings take up more space and fewer aircraft can be accommodated, which means fewer fighters can be fuel (bottle neck that each tanks can only refuel 3 at the most, maybe two) – so then you either go with what you have or start another round of refueling to get the package full up. Now if the RFP said we are waiving that, it can be legal. It did not allow that and they did it anyway. It was one of many illegal waivers that the USAF gave. The RFP also did NOT allow more capacity to be a factor. You can argue all day long more is better (it also costs per the A330MRT bid). Once again the USAF then gave credit for that. Again it can be written that way, but once its NOT, then its a legal document that both parties are bidding on the same apples to apples contract. Not some kind of quick sand boggy in motion we are going to allow this, give that and turn the award into a complete fraud and in this case legal shambles. The A3300 has a large wing, its heavier, it has more drag and its only going to be better than a 767 if it carries less fuel. Bid documents are done the way they are so its as level a playing field as you can get. The A330 as an KC-135 replacement was doomed to failure on a heads up basis. It looks to be quite competitive if not beat the KC-46 all hollow as a KC-10 replacement. Put as many US made systems on it that are options (engines) and it has my vote for that. I would love to see A330s made in the USA! Mike Hafer wasn’t being misleading at all. One only need to look at the context to see this. He is saying this in the context of having a new airplane, the KC-46A, to sell as opposed to just the KC-767. The KC-46A trails the KC-30 by years which is one of the reasons, in his opinion, that the A330MRTT gained the upper hand on the international market. You may not agree with his opinion, but he was not insinuating that somehow the base airliner tech on the 767 was newer than on the A330. Not sure why you chose to pick on this one, but he is obviously talking about the KC-46 winning the KC-X competition, not that other countries have KC-135s to replace. This is obviously generally true for any aircraft. Smaller aircraft can generally operate out of smaller airfields than larger aircraft. The KC-46 is smaller in every way than the KC-30, so it can operate on narrower runways , taxiways and ramps, and can be housed in smaller hangars. Air bases in theater (closer to the fight) are generally smaller than main airbases where the aircraft are based and routinely operate. The comparison that you repeatedly make saying that the A330MRTT can operate with the required fuel load from twice as many airfields as the KC-46 look like it comes straight out of the NG KC-30 brochure. This comparison is dubious for two reasons. First, it is comparing the KC-30 with the KC-767, not the KC-46, and second, it only factors in runway length, runway strength, and elevation, but neglects runway width, taxiway width, ramp size, and hangar size. Finally, you are neglecting the cargo mission when you assert that there is no reason for the tanker to be at a small airfield if there is not a fuel depot there. The mission could be to deliver cargo to the small forward airfield. If anyone is being misleading on this point, it is you and not Mike Hafer. Again, a true statement and not misleading at all. A large cargo door, one that will only fit on the main deck, is needed if you want to transport FULLY LOADED 463L pallets which require an 8 ft high cargo door and a cargo floor that can tie down pallet loaded to 10,000 lbs each. This is what the USAF wants but is impossible with the KC-30 because the lower cargo deck is simply not high enough. The KC-30 simply can’t meet this requirement unless the main deck cargo door option is exercised and the main deck cargo floor option is exercised, if it is even available, and I dare say a level cargo floor option is exercised, which I know isn’t available. Obviously this, wasn’t a hard requirement for various international customers, but now that KC-46 deliveries will be happening soon, other countries might want the KC-46 cargo capability that is compatible with USAF operations. This is true and not the least bit misleading. Well the schedule has been set. First KC-46 delivery in October 2018 and 18th delivery in April 2019. Operational testing will also start in October 2018. According to program officials, Boeing is supposed to have 8 receiver aircraft certified with the KC-46 by the beginning of operational testing. I’m not sure they will achieve that, but they definitely will be certified by the end of operational testing. So, I’m betting that by May 2019, the KC-46 will be certified to refuel 8 receiver aircraft. This is 1 year an 9 months later than the original schedule, in stark contrast to the KC-30 being delivered 2 years late and starting operational boom testing 4 years after that. Besides, Mike Hafer made a promise, which is not misleading unless it turns out to be wildly untrue. Not really sure why you are bothered by this. Carrying more fuel around does cost more money. It’s pretty basic. Also, he is actually admitting that politics plays into it which is something you are always saying. Nothing misleading here. This is true and not misleading. It is misleading, however, to imply that the KC-30 meets the USAF cargo requirements, which it doesn’t. So, the time it takes to configure the KC-30 for cargo operations compatible with the USAF mobility system: years. It seems as if most of the performance advantages/disadvantages between the two tankers boils down to their size difference, except of course that the KC-46, has a higher level of survivability and can operate with fully loaded 463L pallets. From what I can tell, Mike Hafer didn’t make any misleading statements. I don’t know what your background is but I have served under two major corporations and I know how they work. Basically they will piss billions away on upper management whims and projects (up to and destroying a corporation) but they play a game down at the lower levels. You see that in the McNennary and Mueilenberg. One outsourced and tore down the company resources and the other one is buying everything in sight. Its all about ego at that level. Lower down, they then look at a budget and the managers goal is set to reduce his costs by 10%. I have seen that cascade down to spending $100 a month on shop rags and shifting to paper towels. This from a company that is “greeen”. Paper towels can supplement rags, but they are not anywhere close to rags for cleaning. But the manager says, no more rages and I cut the cost to $60 a month (if he is smart he will only cut it the needed 10% so next time he has more to cut). So they claim to save money and cost effectiveness. But you don’t see that effectiveness show up as its hidden in all sorts of other labor related costs. In short its spin and BS. I saw one higher up manager want an assets moved to where he was located. That asset was saving the company huge bucks where it was. He fought a war to move it until he retired. He did all he could to destroy the efficiency of it to the detriment of the company. The only thing that stopped him was the head guy (CEO and its a huge company) had personally put that piece of equipment on that site for the valid reasons he did. He could not stop the guerrilla warfare but he kept it where it was at. I saw one operation go through 5 stages of completion. While it saved short term money, it cost them 5 x a much each time they did a bit more. I saw them do a structural change because it saved structural money costs. It threatened to delay the whole badly needed project. And the insisted the contractor maintain the time line. As long as those cast made their section look good, they did not care about the rest and would have thrown the contractor under the bus for not executing. I call it the Hooray for me and Screw you Corporate attitude. What its about is not what its about. The one that does puzzle me is Korea. They have zero need for the A330MRT capability. I really don’t see them needed a lot of Aerial fueling either. Head scratchier. The KC-46 would have made more sense. Urgency not there wither. Maybe they just wanted the VIP seating thing and cadged it into the Tanker part. RAF could lease aircraft cheaper than brand new A330s for that servicing to Falklands. More what its about is not what its about. Australia does have an interesting need, they not only participate in a lot of Air Activities they are a long way away. I saw their A330 up in Anchorage, they brought some fighters, a support crew for Red Flag Alaska. They have a vast ocean area to cover and do not have bases like the US does. On the other hand, US has bases in Japan, Korea, Guam, probably Taiwan if needed, Singapore, and ………. So while the Pacific is vast the area of operations is much smaller and has bases in the area. As for European contracts, no one else was allowed. Boeing could have worked it out with offsets. What you miss is all of Europe had maybe 30 refueling aircraft. the only reason Airbus can sell tankers there is the subsidies all the buying/ owning countries are willing to pay so they can sell a few to others. We did not get to bid on the Tiger Gunship either. Australia s going to can their as the performance is so awful. When the US fields a system it works, when Europe does it does not. Took the RAAF 5 years to get the A330 working. You can clearly see in how Germany operates that its just a jobs program for them, they don’t support them and they are abysmal on combat ready. And I will be the first to agree, Boeing has turned the KC-46 into a joke for delivery. Usually when they do get it into the field it works well. The C-17 has those issues as well. The airbus a330 tanker is way better than the boeing one. Well that is not what the RFP said was it? Can you put out some specifics are just a spelling error and no backup (it is correctly an A not a) and its 300MRT or KC30. The A330MRT or KC30 is a decent tanker. Depending on what you want it to do and what its for, the KC46 is a better tanker in many situations the US finds itself in as well as at the forward edge of the fight (self defense systems as well as many other systems the A330MRT does not have.